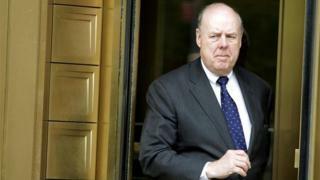 US President Donald Trump's lead lawyer for the special counsel investigation into Russia interference in the 2016 election has resigned, US media report. John Dowd, 77, is reported to have concluded that Mr Trump was increasingly ignoring his advice. Other reports say Mr Trump had lost confidence in Mr Dowd's ability to handle special counsel Robert Mueller. In an email to news outlets, Mr Dowd wrote: "I love the president and wish him well." The special counsel is investigating possible links between Mr Trump's associates and Russia, as well as whether the president has obstructed the inquiry. Last week, Mr Dowd called on the Department of Justice to immediately shut down Mr Mueller's investigation - initially saying that he was speaking for the president. But he later clarified that he was speaking for himself and not on Mr Trump's behalf. Mr Dowd took over the president's legal team last summer. Under his leadership, Mr Trump's team of lawyers advised the president to co-operate with the special counsel. Mr Trump has recently begun publicly criticising Mr Mueller by name, rather than just his inquiry. In response, several congressional Republicans warned Mr Trump not to consider firing Mr Mueller. Senator Lindsey Graham warned that "that would be the beginning of the end of his presidency". Mr Trump has also reportedly insisted he wants to be interviewed by the inquiry, a step Mr Dowd was said to oppose. Last week Mr Trump added combative former US attorney Joe diGenova, who has been a pundit on Fox News, to his legal team. Just 11 days after dismissing reports that he was shopping for new lawyers and tweeting that he was "very happy" with his personal legal team, Donald Trump has hired a new lawyer and parted ways with the head of his legal team. It could be an indication that the president's simmering dissatisfaction with the direction of his legal defence is coming to a head. Up until now, Mr Trump's top lawyers have been pledging full co-operation with Robert Mueller's investigation, assuring that a timely but thorough review of the evidence will end in complete exoneration. Now, however, the president could be opting for a more confrontational approach. His new hire, Joseph DiGenova, has suggested the president is the target of an FBI conspiracy. And last weekend, for the first time, Mr Trump took aim at Mr Mueller by name in a series of incendiary tweets. Mr Mueller is reportedly looking into Mr Trump's business dealings and foreign contacts with the Trump administration beyond just Russia - suggesting that his investigation is nowhere near drawing to a close. The president has been counselled to be patient. That patience could be wearing thin.